The Best Europe Travel blogs from thousands of top Europe Travel blogs in our index using search and social metrics. Data will be refreshed once a week. 2.13 Life Beyond Borders - A Life in Greece & Travel Blog. Europe Travel newsletter is a comprehensive summary of the day's most important blog posts and news articles from the best Europe Travel websites on the web, and delivered to your email inbox each morning. To subscribe, simply provide us with your email address. The Netherlands About Blog The Eurail blog will inspire you to see more of Europe. See where you can go and why exploring Europe by train is an unforgettable experience! tay updated on travel tips and stunning images with the Eurail blog. See where you can go and why exploring Europe by train is an unforgettable experience! Facebook fans 263,511. Twitter followers 10,641. About Blog At Grand European Travel, we are the experts in guided European vacations & river cruises. Choose from destinations & countries all over the world here! Book Today! Our mission is dedicated to taking the hassle out of planning your vacation so you can focus on discovering your destination. Facebook fans 31,944. Twitter followers 2,640. Europe About Blog Rewilding Europe is about making Europe a wilder place, with much more space for wildlife, wilderness and wild values. Bringing the variety of life back to Europe’s abandoned lands and exploring new ways for people to earn a good living from the wild. Facebook fans 25,328. Twitter followers 7,991. Europe About Blog We share with you gems and spectacular and advised sites of Europe to plan your trip perfectly. Facebook fans 58,625. Twitter followers 4,568. Facebook fans 526,199. Twitter followers 89,950. Harlem, NYC About Blog Adventurous Kate: The ultimate guide to solo female travel and inspirational adventures Europe around the world. By Kate McCulley. My mission is to encourage people and particularly women to travel more often and more adventurously. Facebook fans 55,871. Twitter followers 53,172. About Blog European Travel Magazine is striving to bring you an exciting online magazine on travel, history and culture in Europe. We are a team of travel addicts who loves and lives to travel. Travelling all over Europe to bring you in-depth articles on culture, interesting stories on the vast history of the different regions and travel guides, we want to make it easier for you to experience the abundance Europe has to offer. Facebook fans 2,348. Twitter followers 530. London/Vienna About Blog Vienna Austria travel tips and Vienna City Guide to inspire independent travellers. Trip planning for Vienna and beyond. By Vienna Unwrapped. Facebook fans 2,413. Twitter followers 2,399. Ohio, USA About Blog Euro Travel Coach wants to make your travel dreams to Europe come true. Whether you're interested in our custom itinerary planning, joining a small group tour of Tuscany or Piedmont, or arranging a travel coaching session, our team of European-travel experts is here to help. Italian trip planner, France trip planner, Ireland trip planner, custom travel to Italy, custom travel to France, custom travel to Ireland, custom travel to Europe. Expert travel consultant. Personal travel itinerary. Facebook fans 1,069. Twitter followers 53. New York About Blog Plan your trip to Eastern Europe with Jayway Travel, specialists in Eastern Europe tours. Explore Central & Eastern Europe with our tailored vacation packages. We specialize in custom tailored tours and travel in Central & Eastern Europe. Facebook fans 3,182. Twitter followers 998. About Blog The Historic Hotels of Europe is the most prestigious hotel network in Europe representing the finest hotels operating in historical buildings. With over 500 hotels in beautiful castles, palaces, abbeys and estates under one name of quality, the Historic Hotels of Europe, we safeguard the preservation of the European Cultural Heritage for the future generations. Facebook fans 15,063. Twitter followers 1,489. Amsterdam, The Netherlands About Blog Ready to plan your adventurous road trip in Europe? Driving through the Swiss Alps, fields of Tuscany, coastline of Portugal or Norwegian fjords? Travel agency "The Road Trip Guy" has it all! Free travel guides, routes, maps, hotels and tailor-made holiday packages to make your European road trip amazing. Book today! Facebook fans 3,821. Twitter followers 260. 13. Life Beyond Borders - A Life in Greece & Travel Blog. Facebook fans 4,130. Twitter followers 6,576. Fort Washington, PA About Blog Gate 1 Travel is the leader in independent & escorted travel around the world. We pride ourselves on providing more of the world for less! Posts about Europe written by Gate 1 Travel. Facebook fans 208,277. Twitter followers 4,199. About Blog The Alternative Travel Blog focusing hidden European indie and alternative lifestyle culture. Facebook fans n/a. Twitter followers 2,008. Basel City, Switzerland About Blog Travel blog of an Indian expat in Europe:Let's spend less and explore more! The experiences,stories and anecdotes on living in Europe. Facebook fans 2,768. Twitter followers 3,975. Europe About Blog A Blog full of ideas, travel tips and guides, suggestions and anecdotes to discover the hidden treasures of the major cities in Italy and Europe. Facebook fans 1,871. Twitter followers 2,311. Montreal About Blog The best travel blog for insightful tips, inspiring photography and no-nonsense advice about travelling to Europe and the rest of the world. Join me on my adventure around the world as I share insightful advice, compelling photography and engaging narratives, focusing on epicurean and no-nonsense ways to travel the world through food, architecture, history and culture. Facebook fans 11,181. Twitter followers 6,588. London About Blog Opodo is the first truly Pan-European travel service created to address the needs of today's traveller. The Opodo UK blog will inform and entertain with tips and tales, pics and videos all about Europe travel. Facebook fans 191,924. Twitter followers 5,440. About Blog Many places around the world have a lot to offer when it comes to parties and destinations in welcoming the New Year. Here you will get travel tips for Europe. Facebook fans 11,339. Twitter followers 22,833. Andalusia, Spain About Blog An adventure travel blog focusing on unusual experiences and forbidden lands. Popular adventure Europe travel blog with beautiful photography, inspirational stories, and tips from around the world by travel writer Nellie Huang. Facebook fans 17,651. Twitter followers 83,044. About Blog A travel blog for people who love to get inspired by reading travel articles, go on holiday and see the world. A travel blog featuring guides about destinations around the Europe. Facebook fans 177. Twitter followers 1,983. About Blog Inspirational Resource for those who travel in Europe, discover Lost Places and love Food. Facebook fans 364. Twitter followers 2,233. About Blog Join us as we bring you insights in living in Europe from a Singlish and Kiasu perspective. Singapore Style. Marbella, Spain About Blog The Marbella blog keeps you up-to-date with the actuality in Marbella, as well as all additions and changes to the marbella family fun. We encourage you to share your ideas & experiences to help other families visiting or living on the Costa del Sol. We love to hear your opinions about Marbella life. Facebook fans 11,875. Twitter followers 5,336. Athens, Greece About Blog A travel blog about Greece and Europe. Blog by Marissa Tejada. I’m an author, travel writer and journalist loving expat life in Athens, Greece. Facebook fans 5,113. Twitter followers 7,402. Dallas, TX About Blog The ultimate travel guide to Europe including blogs about how to save money while traveling, things to do, destination city guides, photos and more. Facebook fans 16,366. Twitter followers 36,003. 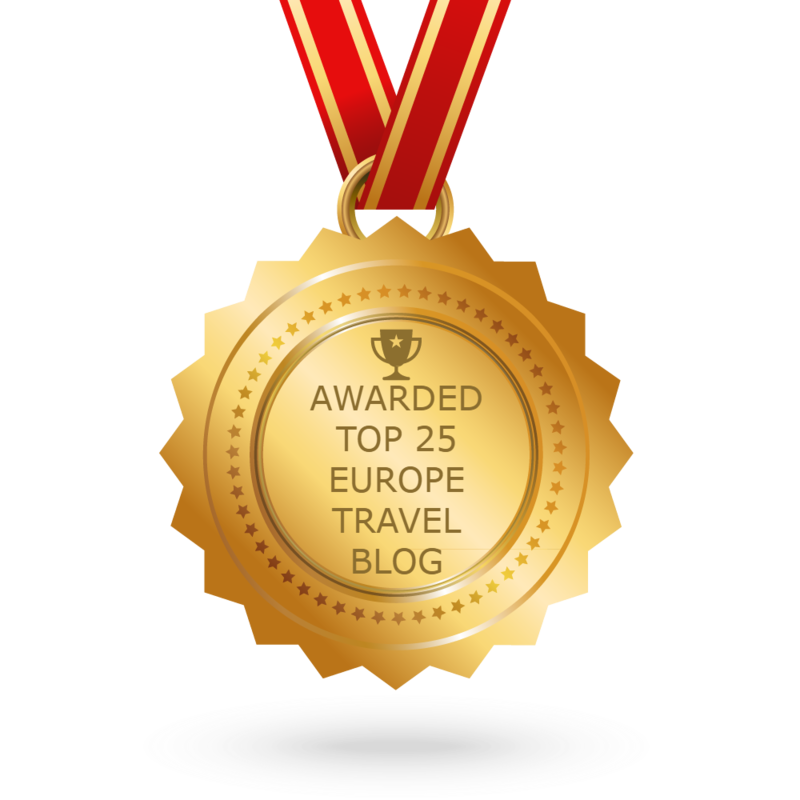 CONGRATULATIONS to every blogger that has made this Top Europe Travel blogs list! This is the most comprehensive list of best Europe Travel blogs on the internet and I’m honoured to have you as part of this! I personally give you a high-five and want to thank you for your contribution to this world.